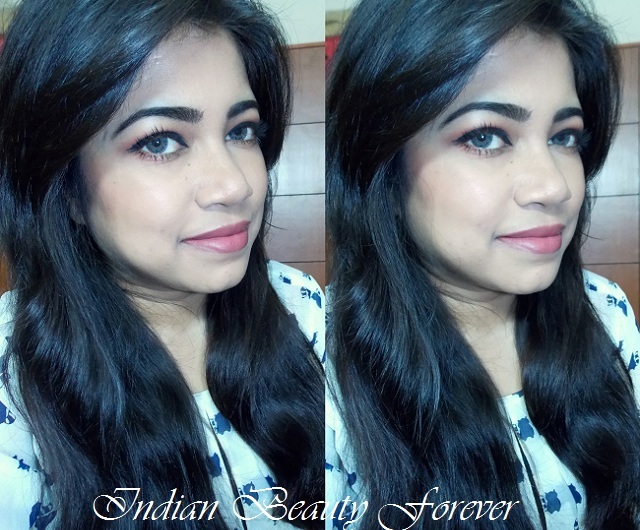 Today, I will be sharing a look that I did before Diwali actually. It’s a look that can be easily carried during the day time and very easy to do. First of all I started with my current favorite Nyx photo loving primer and then Oriflame studio Finish foundation in the shade porcelain and applied it all over my face. I set my makeup with Rimmel London Compact powder in the shade sand beige. For the Blush, I have used Inglot blush no 30 which is a beautiful and very soft peachy matte color. It is very pigmented though gets blended nicely and evenly. I applied the blush very lightly this time, so, that it shouldn’t be too obvious. Moving on to the eyes, For this look, I did use only one eye shadow and that is a matte warm brown which you can also see looks more like a rusty brown color. It was a color from my 120 professional color eye shadow palette. I started with an eye shadow base which was this time, my Colorbar concealer. It helps even tones the lids and shows off the color better. I used the brown color only on my crease with a tapered blending brush and blended it upwards with a fluffy blending brush later on. I used essence gel eyeliner in a thick slightly winged out manner and finished the eye makeup with Clinique mascara. 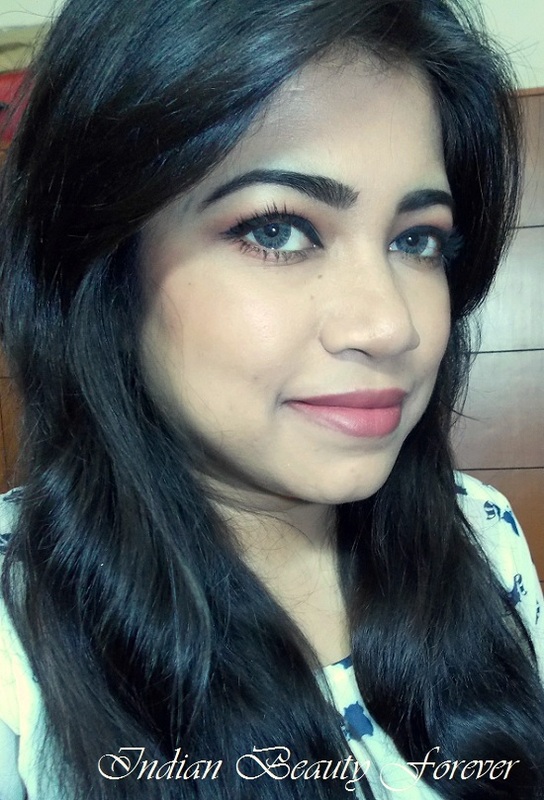 For the lips, I have used lakme absolute matte lipstick in peach carnation that I reviewed yesterday. 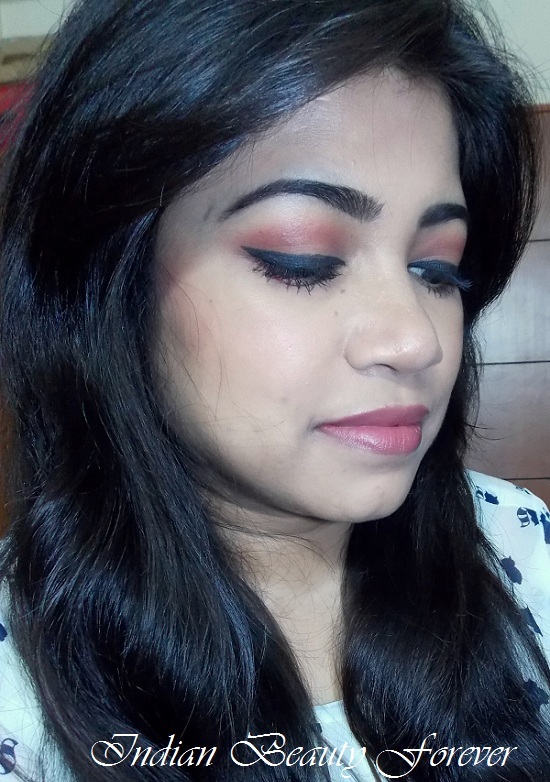 It’s a peachy brown color that goes well with the eye makeup and keeps the look subtle and subdued for the day time weather you go for lunch, meeting or even work. Now, you can convert this very same look into an evening look by applying a darker lipstick as per your preference like red, maroon or even wine. Or the eyes, you may add some silver sparkle only on the lids lightly and some highlighter on the cheekbones. Hope you like this look!! One more thing here, I am very sorry as I haven’t replied to the comments or your Emails in the past couple of days due to some work, but promise will do it soon. You look beautiful love the colors. awesome! I love the eye makeup as always but more than that I love the way your lips look so nice and smooth! You look very pretty Niesha! :D Thank you Arshita!! Thy are not luscious anymore dear. Awesome look Nieshu. U r looking fab a always!